The RCB Library has digitised one of its most significant medieval manuscripts: The Red Book of Ossory (RCB Library D11/2/1). Not only is it available for public consultation on the Church of Ireland website but it will also be published by The Irish Manuscripts Commission in the coming years. The Red Book will be edited and translated by the well known medieval historian and COIHS honorary secretary, Dr Adrian Empey. To mark this significant development, Dr Empey has provided a small insight into content of this precious manuscript. Among its many interesting features includes the lyrics of no less than 25 songs related to the nativity. These, like much of the content of The Red Book as a whole, were written by the Bishop of Ossory, Richard Ledred, whose tempestuous episcopate lasted from 1317 to about 1361. The manuscript book contains 79 vellum leaves, and was composed largely in the 14th century during Ledred’s time. Later entries were added, the last of which are dated from the reign of Elizabeth I. 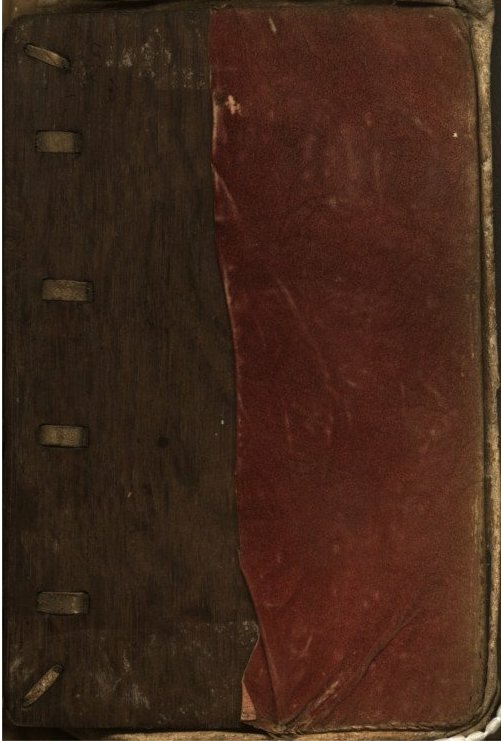 The Red Book derives its name from the colour of the leather binding, faded on the outside, but still visible inside the cover. Like other medieval episcopal registers, it contains a wide range of documents that defy classification, the choice of which depended on what was important to individual bishops, in this case by Ledred, whom Dr Empey makes clear in his presentation was ‘one of the most extraordinary bishops ever to occupy the see of Ossory’. The volume is internationally renowned for a number of reasons: it contains, for example, numerous documents of legal interest, such as the provisions of Magna Carta. More exceptionally, it contains a lengthy medical treatise on aqua vitae, or what we would call cognac, that occupies three and a half closely written pages in Latin shorthand. 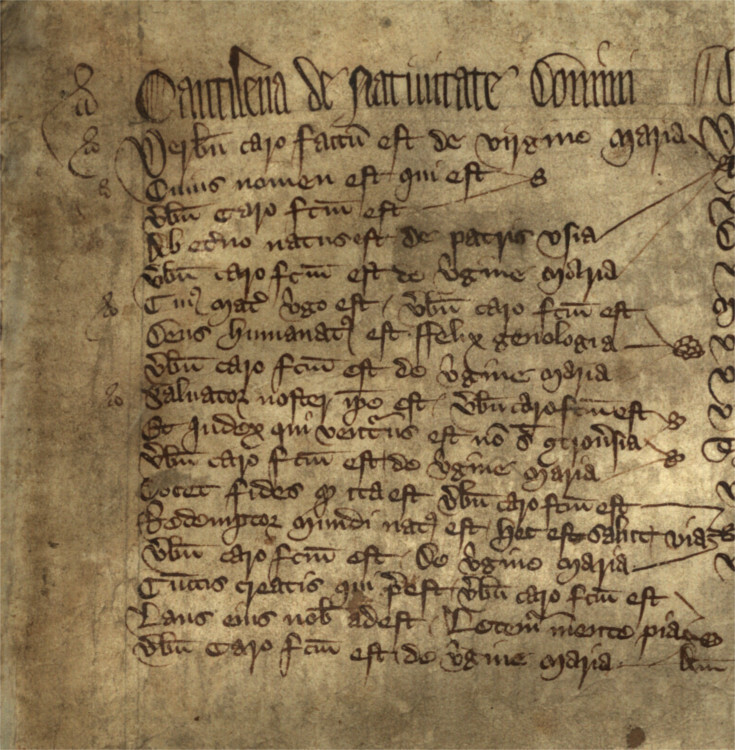 While such a treatise is perhaps very seasonal, the reasons for its inclusion in the register were more medicinal, perhaps in some way linked to the Black Death that ravaged Kilkenny in 1348. Nevertheless it does provide the earliest known recipe for distillation known to exist in any Irish manuscript and its content of is particular contemporary interest to Ireland’s whiskey industry. Another reason for the international fame of The Red Book is the collection of 60 Latin lyrics that make up the final folios, all but 13 of which were composed by Ledred. Many of the songs honour the Virgin Mary, and whilst all were not necessarily related to Christmas, Ledred intended them to be sung at the great festivals and on other occasions, so it looks very much as though he had the celebration of Christmas chiefly in mind, analysed in more detail in the online presentation. ‹ W.G. Neely Postgraduate Prize 2019!